Perfect for the High School Grad! In The Graduate Survival Guide, Anthony ONeal and Rachel Cruze identify five mistakes to avoid making in college. Authentic, real-life stories from Anthony, Rachel and others will help high school graduates recognize how these mistakes can negatively impact their financial future. Wall Street Journal best-selling author Jon Acuff reveals the steps to getting unstuck and back onto the path of being awesome. Your 20s are a period of Learning. This is the decade of trying a thousand things, exploring a multitude of interests, and discovering what really motivates you. Your 30s are a period of Editing. This is the decade of sorting out interests, where you discover what you really care about and who you really are. Your 40s are a period of Mastering. This is the decade of narrowing focus, honing skill sets, and becoming an expert in your field. Your 50s are a period of Harvesting. This is the decade of reaping the benefits of good decisions and enjoying the highest income-earning period in a career. Your 60s are a period of Guiding. This is the decade of mentoring, training, and encouraging others on their own road to success. Finish lines are dead – Boomers are realizing that a lot of the things they were promised aren’t going to materialize, and they have started second and third careers. Anyone can play – Technology has given access to an unprecedented number of people who are building online empires and changing their lives in ways that would have been impossible years ago. Hope is boss – The days of “success first, significance later,” have ended. A new generation doesn’t want to change the world eventually; they want to change it now through the wells they kickstart in Africa and the TOMS they wear on their feet. The value system has been flipped upside down. There are only two paths in life: average and awesome. The average path is easy because all you have to do is nothing. The awesome path is more challenging, because things like fear only bother you when you do work that matters. The good news is Start gives readers practical, honest and actionable insights to be more awesome, more often. It's time to punch fear in the face, escape average, and do work that matters. The Graduate Survival Guide is the book and video you wish you had before you went to college! 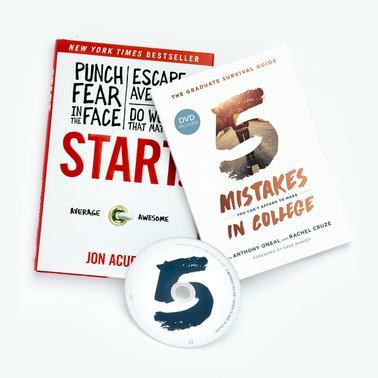 This national best-seller unpacks the five most common mistakes college students make and covers topics like student loans, budgeting and saving money. 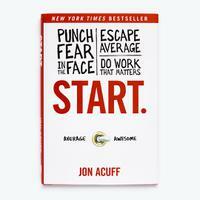 Explore the five stages every life goes through on the path to awesome and look at what it takes to punch fear in the face, escape average and do work that matters.